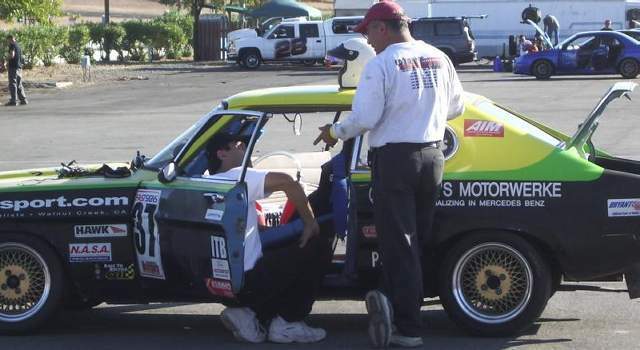 Shed Racing competed in NASA's final points event for 2005, October 29-30 at Thunderhill Raceway Park, in the GTI Cup class. There were only 2 cars in class this weekend, with Ron Swett driving the whole event. The only other competitor was GTI class points leader Carlos Suarez. GTI Cup regular Joe Craven was also present, but wasn't competing. 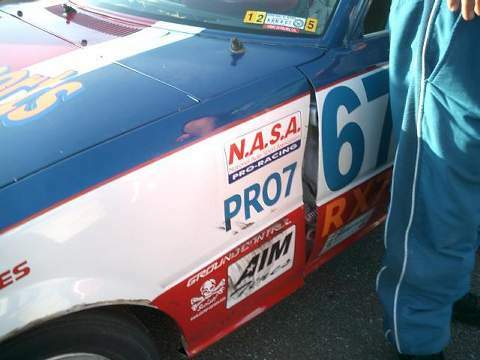 Joe was testing in his Ford Capri for the upcoming 25 Hours of Thunderhill. Ready to go, Friday morning. Ron, Cindy and Catherine left Fremont for the track about 2 PM on Friday, and made it about 30 miles before a rear tire failed on the RV. Luckily they were still in a populated area, and a quick phone call to Ron's coworker Joey, followed by a brief Internet search located a tire store 2 miles away. 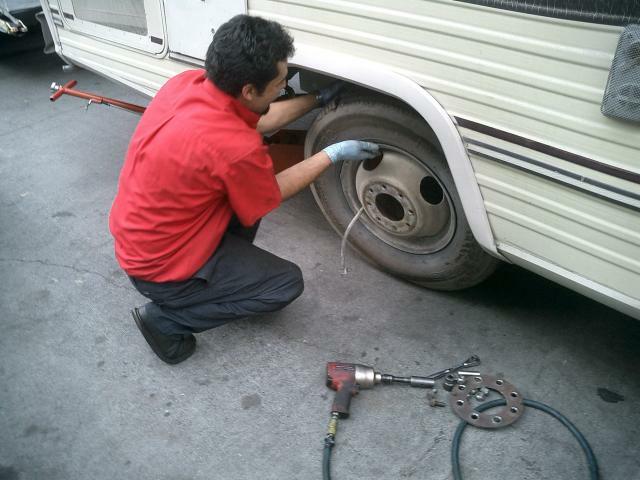 Ron limped the RV into Big-O tires where 2 new tires were sourced for the RV, and they were back on their way after a two hour delay. They made it the rest of the way to the track without incident, and unloaded in the dark. The run groups Saturday were limited to only two, qualifying and the race, as most of the afternoon was taken up by a 3 hour enduro. 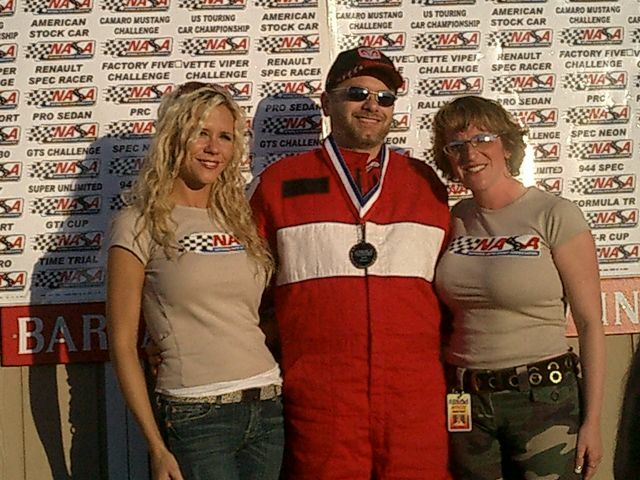 Ron made breakfast for Cindy and Catherine, then went out for to get a feel for the track conditions, and qualify. Carlos set the fast time of the session, with a 2:16.5, followed by Ron with a 2:17.7. After the session, Ron noticed the camber on the left side of the car didn't look right, and discovered the bolts for adjusting the camber had become loose, allowing the alignment to change under load. He also discovered cords starting to peek through on the left front tire. 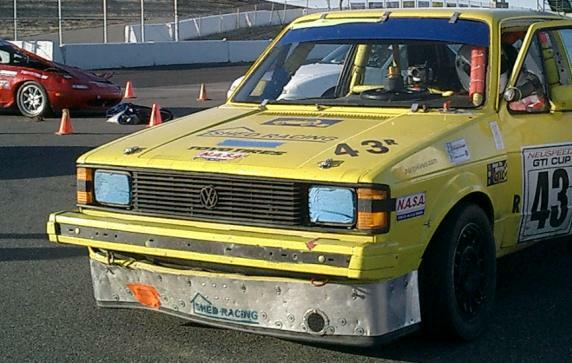 He rotated the left side tires, to put the corded one on the left rear, the corner than is least loaded at Thunderhill. 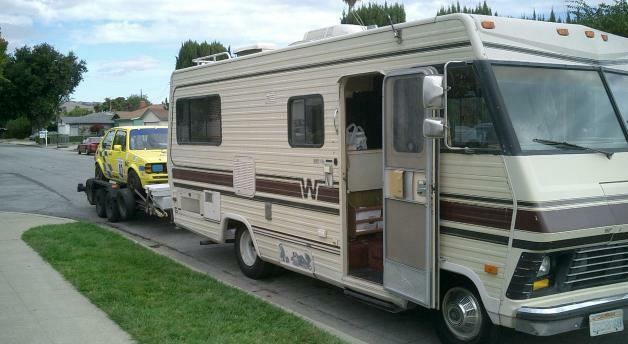 Cindy, acting as crew chief for the weekend, made an air pressure adjustment, and Ron went out for the race. The race was scheduled for a standing start, but instead of the usual single green flag for the whole group, there were three green flags for different classes, confusing everyone. Ron started to go on each green flag, but stopped when nobody else started. On the third green, Ron got a bit of a jump on Carlos, and led into the first corner, with Carlos right on his bumper. Ron held the lead through turn 7, where Carlos got enough of a run on Ron to get inside of him, and take the line away through turn 8. Ron ended up going wide on the exit of 8, and hit a couple cones, denting the front valance. Carlos ended up going wide in turn 14/15, giving Ron a higher exit speed from the turn onto the front straight, allowing Ron to pass Carlos for the class lead. Ron spent the rest of the race chasing Marcus in the Miller Motorsports RX7, driving as fast and mistake free as possible with Carlos doggedly on his rear bumper. On the last lap, Carlos made a move in the esses and again in turn 14/15, but Ron managed to hold on to the lead for his first class win, crossing the stripe about .3 seconds in front of the 42 car. Ron's best lap of the race was 2:14.278, slightly faster than Carlos, who turned a 2:14.398. Shed Racing gets its first win!!! 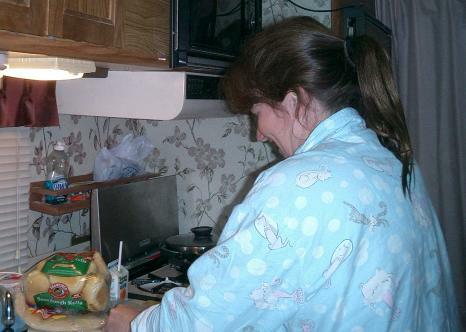 The only crew chief to wear kittie-cat jammies. Sunday morning Cindy made breakfast, Ron beat the front valance back into shape for the morning practice session. The warmup was reduced to only two laps, when a Spec Miata went off in turn 8 and rolled several times. The driver was OK, but went to the hospital to get checked out, just to be safe. The Miata was totaled. In the shortened session Ron turned a 2:24.7 and Carlos 2:22.5. The next session on the schedule was the qualifying race. Ron noticed in the formation lap that there was a lot of dirt to the left of the racing line just after the turn 5 bypass, and made a mental note to avoid this area for the first few laps, giving it time to get cleaned up some by passing cars. 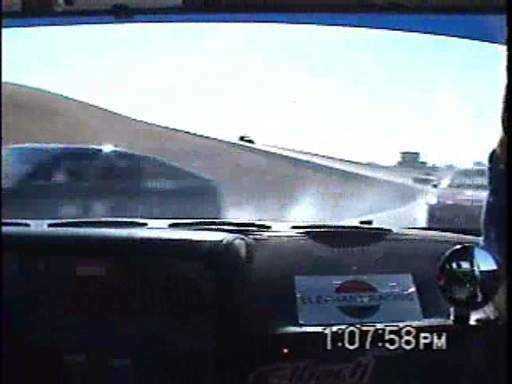 The green flag fell, and Ron tucked in behind Carlos when a RX-7 stalled in front of him. Ron stuck on Carlos's rear bumper through turn 4, when Carlos passed a Honda Challenge CRX on the left. Ron tried to stay with Carlos, and also went to pass on the left over the bypass, right where he didn't want to go, where the dirt was on the track. Ron spun when he hit the dirt, and went of the track into the infield on the left. Once it was clear, Ron pulled back on track. With no real chance of catching back up to Carlos, Ron treated the rest of the race as a practice session, just trying to be consistent and hit his marks, and save the car for the points race. His best time of the session was a 2:16.0 and Carlos pulled a 2:14.8. When Ron returned to the paddock, he discovered the boot for the right front CV joint had torn open, spreading grease all over, and allowing dirt to enter the joint. He also found one of the front sway bar mounts had broken where it bolts to the left A-arm, as well as beating up the front valance again on yet another cone. Ron did a temporary fix to the sway bar mount with a hose clamp, but there wasn't anything that could be done for the CV boot in the time he had before the race. Crew Chief Cindy again made an air pressure adjustment, and Ron went out for the points race. On the out lap, he noticed the right front felt a little strange, probably due to the CV joint, and decided to try and take the start easy to try and make sure it lived through the race. The green fell, and once again Ron tucked in behind Carlos, with the intention of following him in traffic for the first lap and see what the 43 car had left. This turned out to be a bad move. By the exit of turn 2 there were three cars between them, and Ron was trailing by about 10 car lengths. A pair of RX7s went off and back on between 3 and 4, bottling everyone up behind them. By the time Ron crested the turn 5 bypass, Carlos was already through turn 6, and pulling away. By the end of the first lap, Carlos had pulled a 6 second lead, and Ron abandoned the "take it easy" approach and started pushing to try and catch up with Carlos. Unfortunately Pro-7s spinning off track in turns 2 and 9 the next lap, plus being stuck behind some slow Honda Challenge cars allowed Carlos to stretch his lead to almost 9 seconds. Once clear of traffic, Ron put together a string of fast laps, and started reeling Carlos in. In laps 7 and 8 alone, Ron cut the lead by 5 seconds. When the white flag came out indicating the last lap, Carlos's lead was down to 3.7 seconds. Ron knew he was almost out of time, and pushed even harder, to try and catch Carlos at the finish. Unfortunately, he pushed a little too hard, and took the turn 5 bypass a little too hot. When the rear suspension unloaded as he crested the hill, Ron spun again, sliding through the dirt off the track on the right side, coming to rest on the pavement, facing the wrong way, with the car stalled. Ron got the car re-fired and pointed the right direction, and finished his last lap to take the checkered flag, some 40 seconds behind Carlos. Marcus Miller has some "incidental contract" on the way to his first Pro-7 class win. 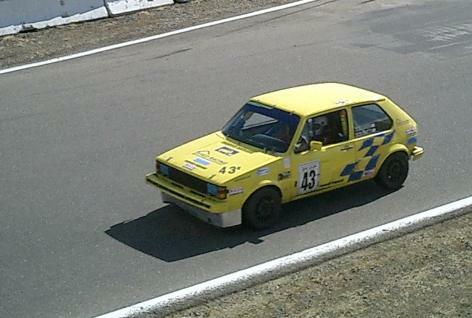 Ron set the best lap time for the Sunday, with a screaming 2:13.567, setting a new GTI Cup class record for Thunderhill. Congratulations Ron! Carlos's best lap of the race was a 2:14.617. 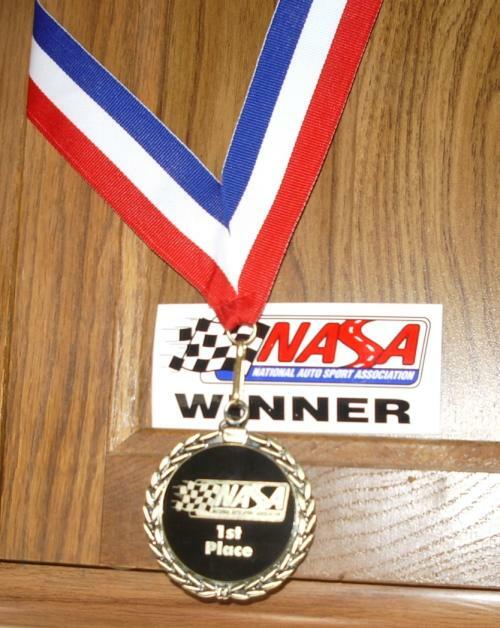 The weekend ended with Shed Racing's first win, Miller Motorsports first win, both teams set new personal best times at the track of 2:13.5, and Shed racing finished Second in the points for the 2005 season. Congratulations also to Carlos Suarez, for clinching the GTI cup championship for the 2005 season. Good Job Carlos.